Tech giants like Apple and Google are always looking for more ways to innovate and more industries to dominate. 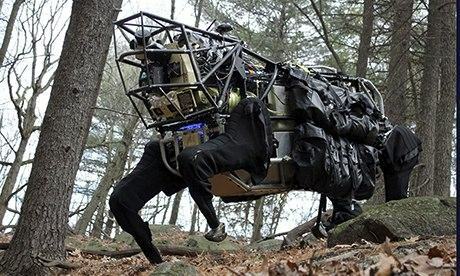 Take the decision by Google to buy a company that designs animal-like robots of death (basically four-legged Terminators). Google basically woke up one day and said “hey, people are using our products for pretty much everything but annihilating the human race and leading to the apocalypse, so that’s really a niche we need to get into.” Meanwhile Amazon decided that drones can be used for more than seek and destroy missions – they can also be used to deliver DVDs and books to your home. Apple has a different kind of new idea: If Google and Amazon don’t bring about the end of the human race, those humans will continue to eat at restaurants, so let’s make that experience as easy as possible. Apple has submitted an application for a patent on new software for booking reservations and ordering food at restaurants, but it’s a lot bigger than that. This is fully integrated software that covers the whole dining experience. You can use the app to book a reservation, but it also tells you how long the wait will be if you reserve then. Want to go to a restaurant without a reservation? It can tell you how long the wait will be for that so you don’t drive all the way to the restaurant only to be driven away by your impatience. Customers who use the app will also use it for ordering their food. It will keep track of what you normally order and make suggestions, kind of like human servers did before Google replaced them with Terminators. The app also takes dietary restrictions into account, so you don’t accidentally order something that conflicts with your allergies. The app also uses what you order to calculate the wait times of other diners. Based on what you order, the app is able to figure out how long the average customer will take to eat that meal. The app then calculates wait times by taking into account not only table availability, but what is ordered by the people at those tables and how long that person usually takes to eat (yeah, the app will stalk you and keep track of all of your eating habits). If and when the app launches, it could make dining in a restaurant much more pleasant for the customer. Of course, it could also mean fewer front of house jobs at the restaurant. But I guess this is how technology works. Assembly line people are replaced with robots, UPS drivers are replaced with flying drones, and an iPhone app replaces waiters.